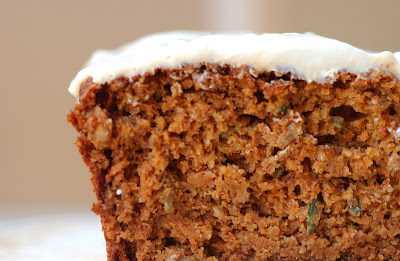 This carrot cake is adapted from my carrot muffins recipe. It needed a little adjustment on the olive oil and sweetening side. I exchanged the frosting with an all-natural cream cheese and agave syrup version. 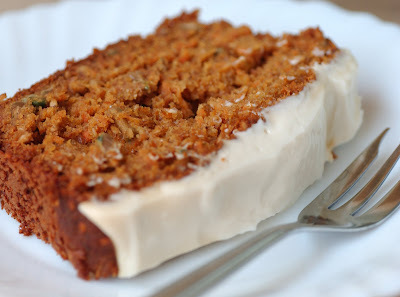 So here we go: a super-moist, natural and absolutely delicious carrot cake, definitely suitable for and liked by children. Even my 18-month-old daughter who isn't big on any solid foods (neither sweet nor savory, no healthy and not even unhealthy stuff), had a couple of bites the other day. I take that as a big compliment!!! Preheat oven to 180C/375F. Line medium loaf pan with parchment paper. Combine flour with baking powder, baking soda, and salt. Set aside. Combine all wet ingredients: beat the egg lightly, stir in oil and syrup, vanilla and yogurt. Grate the carrots and add the seeds. These can be replaced or complemented by any sort of nuts (walnuts will always be good here). Add wet ingredients to the dry ingredients and fold them gently. Don't overmix. Let the cake cool down completely. For the frosting, mix the agave syrup into the cream cheese and put on top of the cold cake with a spatula.